This summer, Copenhagen’s lakes and ponds experienced massive water shortages, losing an unprecedented 90,000 litres of water every hour through evaporation during the drought. Worst hit, or at least most visibly, were Copenhagen’s famous ‘Lakes’, where water levels shrank dramatically. Still in late October, large sections of the lake beds remain exposed – both a serious eyesore and a source of unpleasant odour. However, all of this could be avoided, contends the environmental foundation Miljøpunkt Nørrebro, as there is a huge water supply close at hand that could be used to top up the lakes and ponds and cool down the rest of the city: the rapidly rising groundwater. 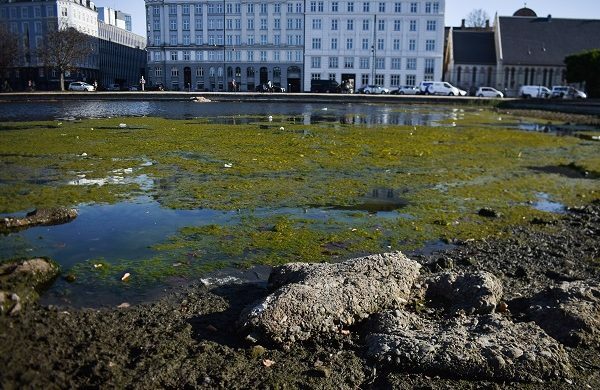 “Copenhagen’s groundwater has been steadily rising in recent years – the extent of which is creating problems for the foundations of buildings in certain areas,” explained Fionn Murphy from Miljøpunkt Nørrebro to CPH POST. The water shortage in Copenhagen was further compounded by not enough water reaching the lakes from their primary sources – Utterslev Mose and Emdrup Sø – due to their own critically reduced water levels. Additionally, the accumulation of heat in the concrete and asphalt of the city during hot summers results in the densest parts of Copenhagen becoming up to 12 degrees warmer than areas in the outskirts, which presents a huge danger to the most vulnerable sections of society: the elderly and the chronically ill.
“Intervention is needed to preserve the recreational and environmental value of these vital water bodies. Our lakes are shrinking in the summer months and so is their potential to combat the urban heat island effect,” continued Murphy. The water issue is expected to become even more prevalent in the coming years with the potential intensification of climate change.